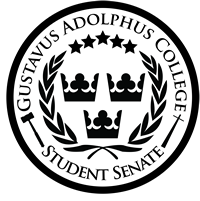 Welcome to the Gustavus Adolphus College Student Senate Online Voting System. You are most likely know why you are here (to make your voice heard! ), so let's just get started. You will need to log in with your Gustavus username and password to continue. Although we require you to authenticate, all votes remain completely anonymous. Must be a current student at the College with a Gustavus username and password. Must have year in credits value between 1 and 7. This means you are either a first year, sophomore, junior, senior, fifth year student, exchange student, or PSEO. Must have an anticipated graduation date in the future, i.e. you haven't graduated. Must be a valid voting time. Poll opens on Thu Mar 21, 2019 at 9:30 am and closes on Thu Mar 21, 2019 at 10:00 pm. Have questions? During election hours, Student Senate will be tabling outside the Caf in the Campus Center. You can always stop by the Senate office in the Gustie Den and see if someone is there as well. Otherwise, you can contact the Elections Committee Chair (Ombudsperson) -- check the Senate website for details. This is not a valid time to vote. Please double-check to make sure you are voting at the right time. You will need to log in to continue voting. This website is managed by the Student Senate Technologies Director. Brought to you by your friendly neighborhood Spider Man Student Senate.